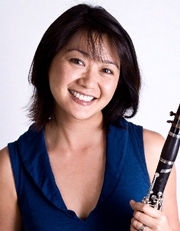 Ixi Chen has been the Principal Second Clarinet of the Cincinnati Symphony Orchestra since 2001. Born in Taiwan and raised in California, she began playing the instrument at age eleven and was the youngest pupil of the late Rosario Mazzeo. She went on to earn a Bachelor of Music degree from the Manhattan School of Music and a Master of Music degree at the University of Southern California with Yehuda Gilad. Her teachers also include Wolfgang Meyer of the Hochschule für Musik Karlsruhe and David Krakauer. Ms. Chen has performed in concert halls throughout Europe and Eastern Europe, including performances at Schleswig-Hostein, Rheingau, Evian, Thessoloniki and Midsummer Lights of St. Petersburg Festivals. She has served as Principal Clarinet of the Philharmonie der Nationen in Hamburg Germany and has had fellowships with the Tanglewood Music Festival and the Aspen Music Festival. Ms. Chen is also a very active chamber musician, recently founding the Concert:nova here in Cincinnati. Concert:nova is an innovative and eclectic chamber music group that is about to embark on its inaugural season this coming fall of 2005. She is also a frequent performer with the Linton Chamber Music series. June 2006 brings Ms. Chen to Germany on a chamber music tour with members of the Berlin Philharmonic. Currently she is an adjunct faculty member of the University of Cincinnati College-Conservatory of Music and on music faculty of the Seven Hills School. Author of Adventures in Music, a guide for teachers of K-6 music teachers, she has been a private teacher since 1991. BM, Manhattan School of Music.